"The brief for this Joya Villas project was to create two large homes in a small area with an inclined topography. The design response from the team was to create a lightweight frame that could break down the normally solid walls and spaces created in a typical property. These frames rest on top of one another and allow for a much lighter transition between the slope of the land and the hanging trees below. When viewed from the ocean, Joya Villas seem completely integrated into the landscape, as if they were born from out of the mountain. Blurred indoor-outdoor living. Including glass window walls, interior planted gardens, bathrooms that open up to the sky and pools located next to kitchens. 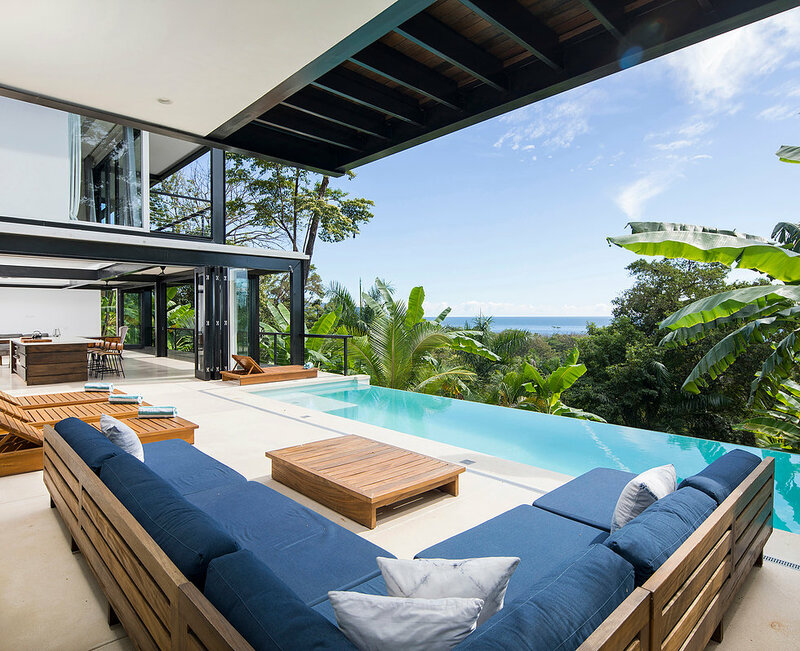 Studio Saxe is one of the few architects working in Costa Rica that gets this right. Modernism, in a jungle. The crisp white villas are a perfect foil to the lush, wild landscape and dirt roads of Santa Teresa. Privacy, in a group setting. Each villa has 4 master bedrooms, private decks and multiple hang-out areas. Even with a group of 10 there’s a place to quietly read a book. Pure luxury! The location. World-class surfing, yoga, and organic restaurants are a short walk or drive away. Benjamin Garcia Saxe set up his own practice in San Jose, Costa Rica in 2004, with the aim of exploring our relationship with the natural environment through architecture. Since then, Studio Saxe has grown into an award-winning international practice made up of a multidisciplinary team, creating buildings and spaces by blending technological innovation with handcrafted techniques to form truly sustainable designs.